Detecting dangerous blood clots, which can cause life-threatening conditions such as strokes and heart attacks, leading causes of death for men and women in the U.S., has been a coveted and elusive goal. But scientists are now reporting progress in the form of a simple urine test. Their study, in which they demonstrated that the test works using laboratory mice, appears in the journalACS Nano. Sangeeta N. Bhatia and colleagues, including lead author and Ph.D. candidate Kevin Lin and postdoctoral fellow Gabriel Kwong, point out that blood clots — clumps of platelets and fibrin proteins — can threaten to choke off blood flow and lead to a wide range of serious and sometimes fatal conditions including atherosclerosis and stroke. Usually, blood clots are a good thing. They form a plug that stops the bleeding after an injury. But sometimes, a clot forms when it really isn’t needed, such as when a person sits too long on a long-distance flight and develops “deep-vein thrombosis.” In that case, a clot forms in the leg, blocking blood flow and causing leg pain. But it also can dislodge and move throughout the body to the heart or even the brain, which is life-threatening. 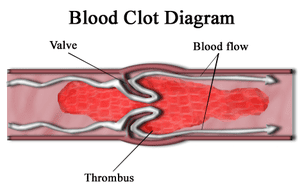 Diagnosing a blood clot, or thrombosis, is tricky, however, and current clinical tests aren’t always reliable. Bhatia’s team wanted to develop a simple and more reliable way to test for these obstructive blood clots. They describe development and testing of “synthetic biomarkers” — lab-made materials for detecting what is going on in the body. They added small pieces of proteins called peptides onto nanomaterials that are similar to those already approved and used in the clinic. They injected the tiny nanomaterials into mice, which are stand-ins for humans. The peptides got chopped up if a blood clot was actively forming in the mice, and those peptide fragments were detected in a simple urine test. “Our results demonstrate that synthetic biomarkers can be engineered to sense vascular diseases remotely from the urine and may allow applications in point-of-care diagnostics,” the researchers state. April 10, 2019 - Tip Sheet: Strategies for an HIV cure; early detection for lung cancer disease; and a look at blood clots and cancer NewswiseBelow are summaries of recent Fred Hutch research, with links for additional background and media contacts. April 11, 2019 - AHRQ Awards Physician $1.1M Grant for Clinical Decision Support EHRIntelligence.comA Northwell Health physician won a $1.1 million grant to develop and test clinical decision support systems. April 1, 2019 - A new wearable device may detect cancer with more precision Medical News TodayResearchers are developing and testing a wearable device that can detect the presence of cancer cells in the bloodstream with greater accuracy. April 18, 2019 - This man invented a spell-checker for prescriptions, and it's saving lives From the GrapevineDr. Gidi Stein's MedAware software eliminates errors and is now in use in the United States and Israel.